Would You Have Done This For $1.30 An Hour? Continuing our weekend tribute to exhibitors committing acts of sheer madness, we salute this hirsute performance artist who’s clearly tossed aside all notions of self-preservation as he combines those time-honored showman staples --- the gorilla suit and the human fly. 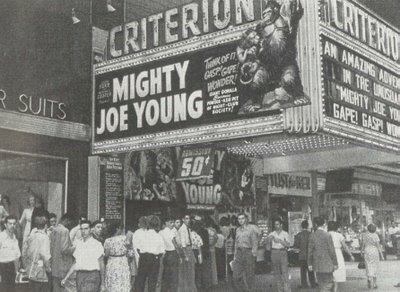 Was the success of Mighty Joe Young at the Criterion worth a man’s life? Evidently, management thought so. Otherwise, they wouldn’t have sent this hapless hireling out on such a fool’s errand. Ballyhoo is all well and good, but crossing Broadway hand over hand on a wire --- fifteen stories up --- suggests a theatre employee dedicated to the point of lunacy. 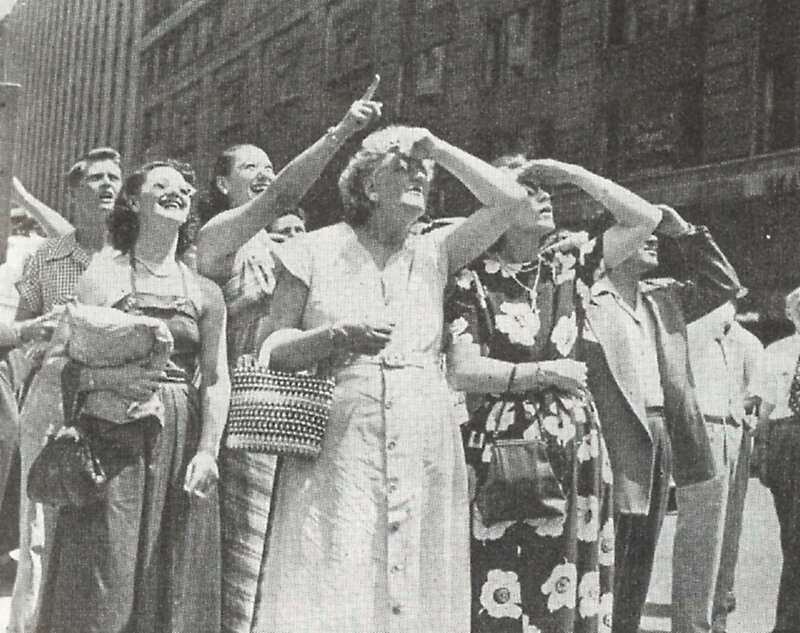 That crowd below registers genuine alarm, but would they necessarily rush off to the Criterion in the wake of such an exhibition, or simply call the nearest police officer to throw a net over an obviously disturbed individual? 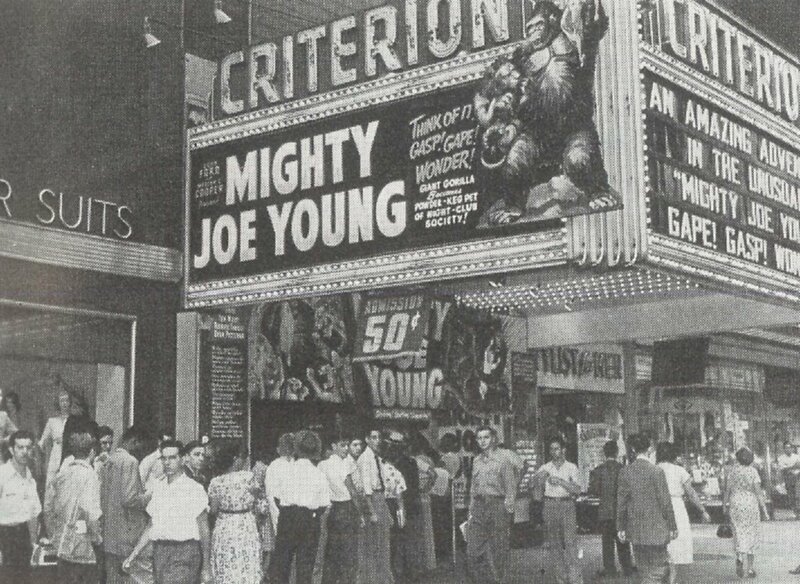 Something must have gone right, because that mob of patrons looks ready enough to part with their fifty-cent admission --- but then, who among us wouldn’t have been happy to do the same? You don't see words like "GAPE!" and "GASP!" on marquees anymore. 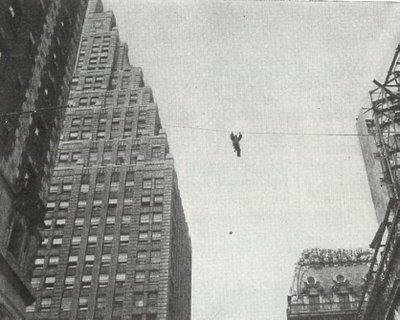 You don't see guys in monkey suits clambering over Broadway anymore either. Maybe David Blaine can revive this stunt. 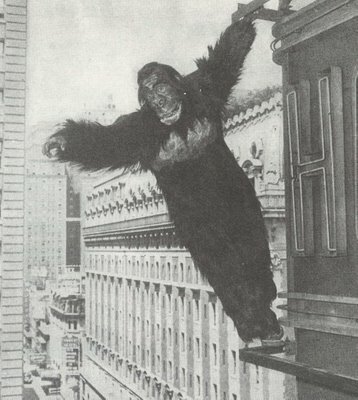 For "King Kong Lives" in '86, the theatre I worked for in Atlanta had me in a gorilla suit with a "Baby Kong" sash. I clambered around our marquee out by the main highway during rush hour. It actually got kind of cold up there, even covered in fur.